Our Thanksgiving dinner was great, despite of the fact that we just got back from San Diego on Wednesday night, and had to stop at the grocery store to pick up some last minutes ingredients on the way home. But we made it. Big C got overzealous last week when I took him to Whole Foods to pick up our turkey. He choose a 16 pounder (it's for 4 people) and was very adamant that we couldn't possibly having smaller turkey than that. As we guessed it, we did not even finish a quarter of the bird, leaving us with plenty of leftover. So, after Thai red curry turkey, Indonesian style chicken turkey noodle soup, turkey and Andouille gumbo, and turkey fried rice, I can say it with gusto, I'm done with turkey and will not have any of it anymore, until next Thanksgiving. Pumpkin, however, I still can take. I ended up with about one cup left of canned pumpkin, and was thinking about a way to utilize it. This is what I managed to make last Saturday, and turned out to be a great afternoon snack. To make the dipping sauce (this, you might want to do first, because it takes time to cook and to cool down): Cook orange juice in a saucepan over medium heat, until it's reduced to about 1 cup. Add salt, brown sugar and heavy cream, stir and continue cooking until the sugar dissolved and the sauce is thick enough to coat the spoon. Remove from heat. Add Brandy to the sauce, if using, mix to combine. Let the sauce rest to cool down. 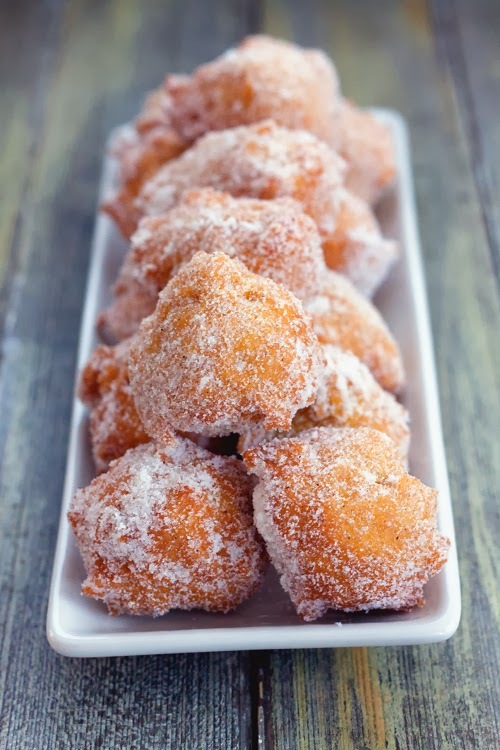 To make the donuts: Mix flour, baking powder and salt in a mixing bowl; set aside. In a separate bowl, beat pumpkin puree, eggs, milk, and butter until creamy. Using a rubber spatula, add dry ingredients to the pumpkin mixture, fold and mix until well blended. Heat the oil in a frying pan to 375 F. Make sure it has enough oil to cover the donuts while frying. While waiting for the oil to heat up, mix sugar and cardamom powder in a large bowl; set aside. Take about a spoonful of donut dough and drop it into hot oil. Continue frying in batches, make sure to fry only a few at a time to prevent overcrowding. The donuts are done when they turn golden brown. Transfer donuts to the sugar mixture, cover completely with sugar, shake the excess sugar off, and place then on serving plate. 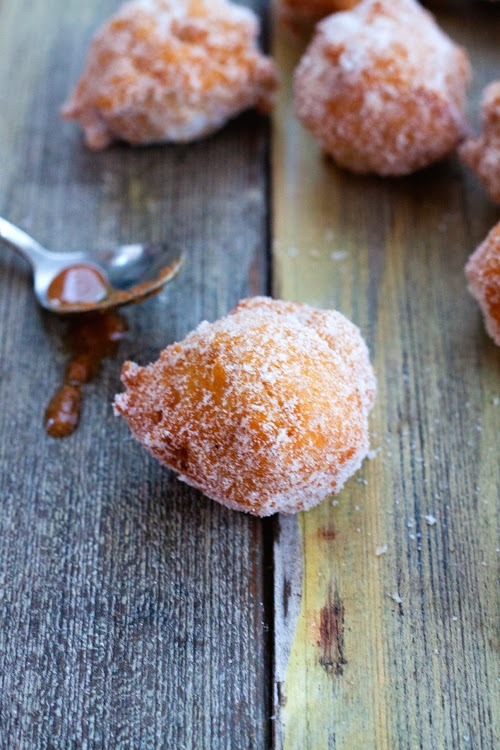 Serve donuts with the dipping sauce and enjoy! 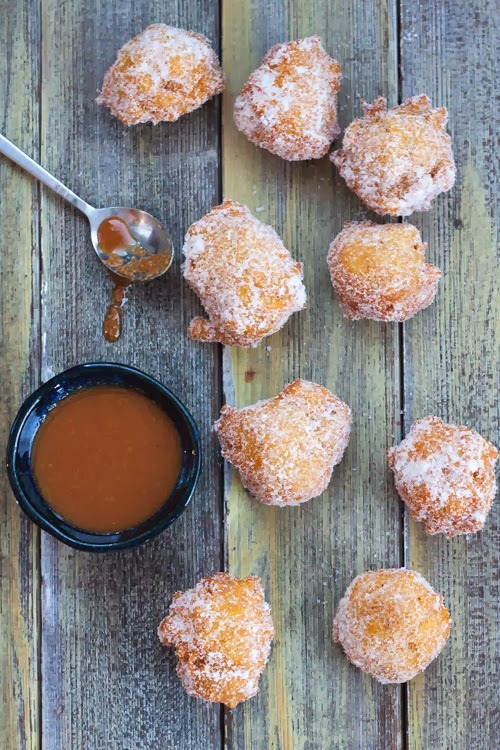 You had me at that caramel sauce!